$401.12 CAD Antique Art Deco Signed Hand Made Chinese Nichols Rug with Junk Ship bright!! $145.61 CAD Hand-knotted Turkish 4'5" x 8'8" Anadol Vintage Wool Rug...DISCOUNTED! $40.11 CAD Loosely woven silk strip 4 1/4" x 27 1/2" Tibet / Bhutan 100yrs+ Liske col.
Buy: $2607.35 CAD Distressed antique Persian Farahan rug. 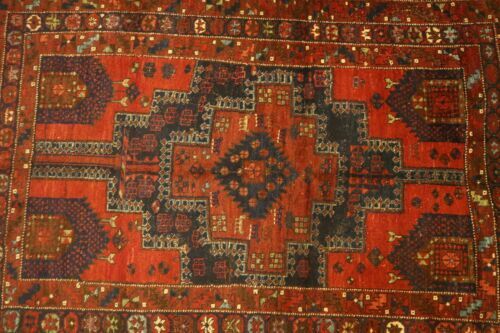 4'1"x 6'7"
$909.23 CAD 4'5" X 7'5" Quality Antique Kishan Hand Made 100% Wool Oriental Rug, Signed! Buy: $668.55 CAD Antique Persian Baluch Rug Circa 1880 60" x 32"
$39.97 CAD IVORY RUNNER 2X7 ORIENTAL AREA RUG PERSIAN CARPET 019 - ACTUAL 1' 9" x 7' 2"